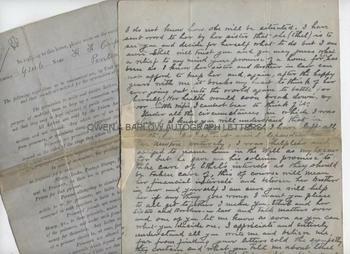 DR H. H. Crippen & ETHEL LE NEVE Autograph Letters Signed. Hawley Harvey Crippen. Murderer and the first criminal to be apprehended by means of wireless telegraphy and Ethel Clara Neve (known as Ethel Le Neve), his mistress. An exceptional pair of letters. 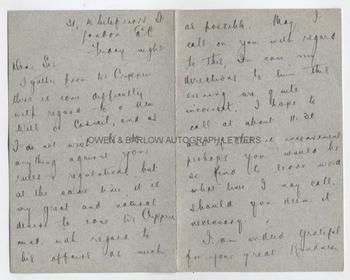 The letter of Dr Crippen is one of the last he wrote following his conviction and shortly before his execution. 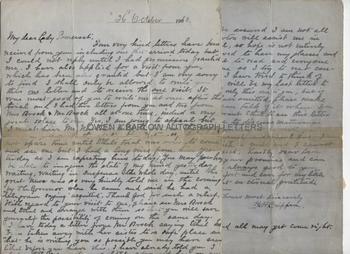 Le Neve's letter, dealing with the affairs of Dr Crippen was written to Crippen's lawyer after her acquittal and before his execution. 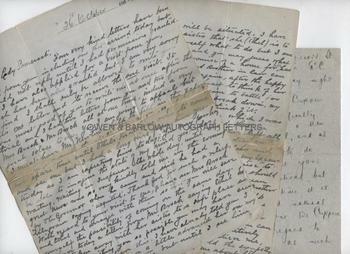 The Crippen letter: ALS 3pp. Pentonville Prison. 26th October 1910. To Lady Somerset. "Your very kind letters have been received from you including one that arrived today but I could not reply until I had permission granted me. I have also applied for a visit from you, which has been granted but I am very sorry to find I shall only be allowed to write you this one letter and to receive the one visit. It was most good of you to write me at once after the trial and I had two letters from you and two from Mrs Brock and Mr Brock all at one time, indeed a very great solace to me. Yes, I am going to appeal but I must have Mr Newton's help to fill in the papers. . . [He could Not] spare time until Ethel's trial was over to come and see me but I had a long wire from him yesterday so I am expecting him today; You may perhaps be able to imagine the state of my mind yesterday waiting, waiting in suspense the whole day, until the great news was so very kindly told me in the evening by the governor when he came and said he had a telegram saying "acquitted". Thank God for such a relief. With regard to your visit to me, please see Mrs Brock and Ethel and arrange with them so you will save yourself the possibility of coming on the same day. I have today a letter from Mr Brock saying Ethel has been taken away by her sister to a safe place and that he is writing you so possible you may have seen Ethel before you have this. I have already told you I hope Ethel may have a little advanced her on my securities by Mr Newton but until I see him I do not know how she will be situated. I have sent word to her by her sister that she (Ethel) is to see you and decide for herself what to do but I am sure Ethel will trust you and you may guess what a relief to my mind your promise of a house for her has been as I know her sister and brother in law can not afford to keep her and, again, after the happy years with me it breaks my heart to think of her ever going out into the world again to battle for herself. Her health would soon break down, my poor little wifie, I cannot bear to think of it. Under all the circumstances in which I was placed I know you will understand that in drawing up my will, in which I have left all to Ethel, I could not avoid depending on Mr Newton entirely, I was helpless and obliged to name him in the will as my executor but he gave me his solemn promise to take care of Ethel's interests as they should be taken care of, this of course will mean her financial interests and between her brother in law and yourself I am sure you will help her if any thing goes wrong. I want you please to all get together I mean you, Ethel and her sister and brother in law and talk matters over and one of you let me know as soon as you can what you decide on. I appreciate and entirely understand all you write me and believe me, far from finding your letters cold the sympathy they contain and what you tell me about Ethel has been of great comfort to me. I am being made most comfortable in my bodily wants, I eat well and sleep well and be assured I am not all broken down. Mr Newton will assist me in making a strong appeal, so hope is not entirely gone yet. I am allowed to have my glasses and all the books I want to read and everyone tries to be kind to me so I try to rest content for the present. I have tried to think of everything knowing this will be my last letter to you, as I am allowed only this one to you, but if there is any point I have omitted, please make a note of it and we can talk of it when you come to see me. I want Ethel to see this letter please, when you come to discuss matters, as it may help her in deciding to be with you. Now please forgive me such a scrawl but I have had to write with a quill and I cannot help the scribbling effect. Lastly dear Lady Somerset, I trust to your promise and can only say, may God be always good to you as you deserve. Comfort and care for my little wifie and believe that an eternal gratitude is always yours from yours most sincerely, H.H. Crippen. I am still hopeful and all may yet come right." 4to. Approx 9.25 x 7.25 inches (23.5 x 18.5 cms). On prison stationary with printed prison rules on communications on the 4th page (verso of page 1), completed by Crippen with his name, prison number and the name of the prison (Pentonville). Separated and with old tape repair to cross-fold that has somewhat obscured one line of text. Slight creasing and a few short edge tears. Some handling marks but else in generally very good condition. The Le Neve letter: ALS. 3pp. 31 Whitefriar's Street, London, E.C. Friday night [no day or month but October 1910]. To "Dear Sir" [Dr Crippen's lawyer Mr Newton]. "I gather from Dr Crippen there is some difficulty with regard to a new Will or Codicil, and as I do not wish to do anything against your rules and regulations, but at the same time, it is my great and natural desire to ease Dr Crippen's mind with regard to his affairs as much as possible. May I call on you with regard to this, in case my directions to him this evening are quite incorrect. I hope to call at about 11.30 and if this is inconvenient perhaps you would be so kind to leave word what time I may call, should you deem it necessary. I am indeed grateful for your great kindness to Dr Crippen and my self and hope you will accept my apologies for tresspassing [sic] on your time so much. Yours faithfully, Ethel C. Le Neve." 8vo bifolium. Approx 7 x 4.5 inches (18 x 11.25 cms). In near fine condition. Crippen had employed Ethel Le Neve as a typist in 1900, when she was then aged 17. By 1905 the couple had begun an affair. Crippen is alleged to have discovered his ex-music hall performer wife, Cora, in bed with a German lodger and she disappeared soon afterwards. Following communications from her relatives, the police investigated her disappearance and human remains were found in the cellar of the house occupied by Dr Crippen. When the investigation began, Crippen had taken fright and fled abroad, taking with him his mistress, Ethel Le Neve, who was disguised as a boy. The couple were arrested when their ship docked in Canada as a result of a telegraphic cable, thereby becoming the first fugitives to be apprehended by this means. Crippen was convicted and hanged in 1910 but Le Neve was acquitted. After the execution of Crippen she changed her name and disappeared into obscurity. She married in 1915 and the secret of her true identity remained unknown, even to her own children, until she died in Croydon in 1967. It is interesting that Crippen refers to Le Neve in his letter as his "wifie" as the two were never, of course, married, although their affair had lasted for at least 5 years. Ethel referred to Crippen as "Hub" in her letters that were buried with him. Recent evidence suggests that Le Neve was not as innocent as she proclaimed and she had spent some time in a library researching toxicology prior to the murder. Some theories suggest that Crippen himself was innocent but failed to adequately defend himself in order to protect Le Neve. Lady Somerset was the English philanthropist and campaigner for women's rights. She had taken an interest in the case of Dr Crippen and appears to have been convinced of his innocence. The correspondence between Lady Somerset and Dr Crippen is well documented but we believe this to be the best of the letters passing between them and the finest Crippen letter to come to the market.